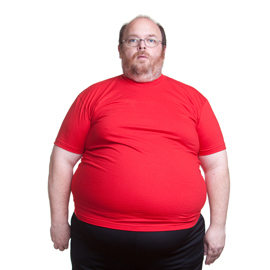 Your genes may contribute the parts of your body that fat develops in. A recent French study analyzing metabolic syndrome, the risk factors that contribute to cardiovascular disease, stroke and diabetes, concluded that certain genes will contribute to the development of a ‘pot belly’. Furthermore, the more genetic traits that people have the greater their chances of developing abdominal fat. For those of us on a weight loss journey, this information may not mean much in the short term, but researchers use this information to expand their understanding of metabolism, nutrition and anatomy. The study that took place over seven and a half years analyzed the diet of 1754 participants. The food intake of patients was tracked and found that any one of five different genetic traits could double the risk that a person would develop a ‘pot belly’ or abdominal obesity. While one particular genetic trait did not increase the risk at all, the study also concluded that consuming an excess of saturated fats would raise the risk even higher. The study may have concluded a relationship between the genes and abdominal fat, but the genes were not necessarily the cause of the ‘pot belly’. Some participants in the study were consuming a great deal more saturated fat than recommended for their daily calorie intake. Currently the FDA recommends that saturated fat should not exceed more than ten percent of the total daily calories in your diet. For people that suffer from metabolic disorder the percentage of recommended fat drops to seven percent. While weight loss can be difficult at times, research such as this makes the bigger picture easier to understand. Knowing that genetics as well as diet and exercise are tightly related lets us know that there is not just one magical solution. Medical weight loss plans and procedures may help, but effort on the participant’s part will make it more successful.